Companies on the cutting edge of their industries know the importance of sustainable solutions. Modern businesses are seeking opportunities to “go green,” improving their environmental measures and reducing their carbon footprint. Resourceful companies are turning to going-green consulting firms for expert guidance in these efforts. No one is better equipped to help companies put sound environmental practices in place. For those seeking ecologically responsible solutions, a partnership with the right environmental firm is key. The going-green consulting firm can offer a portfolio of services to establish green practices for specific projects and overall operations. These services should focus on four essential environmental concerns. Waste management can top the list of costs that eat away at a company’s bottom line. It can also create one of the biggest challenges to businesses that are striving for environmentally friendly practices. How can a company minimize their environmental impact without breaking their budget? A going-green consulting firm can help. The consulting firm offers unique insights into waste management. Their input can allow businesses to reduce costs associated with disposal while transforming cost-draining waste streams into revenue streams. Their solutions offer a triple-play of benefits: reduce landfill use, reduce disposal costs, and develop new sources of revenue. The environmental firm will also ensure the company’s practices adhere to local and regional regulatory requirements regarding waste. This will keep the business in good standing with environmental agencies as well as maintain a positive reputation with stakeholders. Protecting groundwater resources is a priority for companies that are interested in environmental concerns. The Bureau of Underground Storage Tank Regulation (BUSTR) is a major player in this arena. Companies that operate Underground Storage Tank systems must remain BUSTR compliant if they wish to maintain environmentally-friendly practices, protect soil and groundwater resources and avoid fines. Going-green consulting firms remain up to date on all requirements related to BUSTR and ensures each project remains BUSTER compliant. The firm can provide site reconnaissance, site investigations, UST Closures , and remediation plans. The consulting firm will handle all concerns relating to underground storage tanks including the assessment of petroleum contamination of underlying groundwater. The firm’s ESAs provide thorough investigation of historical uses and any relating environmental issues associated with the property. The detailed assessmentsinclude on-site reconnaissance, personal interviews, and thorough research of the property’s historical information, past and current issues, and adjacent properties. Asbestos remains an environmental concern for many projects. Some endeavors require asbestos evaluations and abatement. Going-green consulting firms provide trained professionals to deliver these services. Licensed technicians will ensure the project aligns with EPA regulations and best management practices. 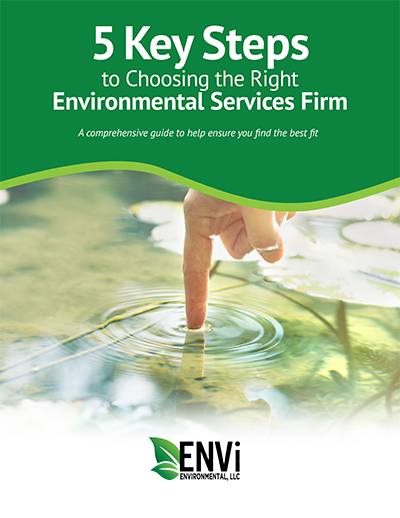 When partnering with a going-green consulting firm, it’s essential to choose one that offers comprehensive services. The firm should be proficient in all areas of environmental concerns, so they can provide seamless services to meet environmental objectives effectively and efficiently. Leveraging in-depth experience and expertise, the firm should be able to provide solutions for initial assessments, project completion, and ongoing compliance. We offer consistent, detailed methods that result in a high approval rate for the projects we submit to environmental agencies. ENVi Environmental personnel are certified and specialize in hazardous waste, erosion, sediment, asbestos, soil, and OSHA training.